"If you are a couch potato, don't enter the Boston Marathon"
Stonewall, Texas sits sleepily in the heart of the Texas Hill Country. 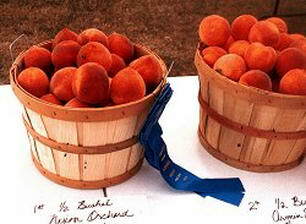 Although still in some disarray from the tornado that devastated the town last October, the Peach Jamboree goes on. For over forty years, Stonewall has celebrated its peach harvest with a great Small Town America event. There is a fine parade, outdoor dance, rodeo and contests of cooking skills with peaches as the main ingredient. This year, having a clear calendar for once, I decided to enter the peach pie and peach cobbler-baking contest. First order of business was to obtain a set of rules for the contest. A study of the rules told me what I needed to know. Most important item was that the entries were to be presented in disposable aluminum pans of a certain size. Also, no refrigerated-type pies or cobblers were eligible, and two examples of each entry were required. Next I hit the Internet and collected a dozen of so recipes for pies and cobblers. Grandma's Cookbook on Texas Cooking Online has a wealth of information. I studied all the recipes and picked out what looked good to me. All this was taking place two weeks before the contest. Looking back, I know now I should have started research and development a year ago. I decided on a piecrust that uses cream cheese and lemon zest. For the cobbler topping, I opted for a really rich recipe with lemon flavor. The first experiment I ran, about a week before the contest, was to construct a pie using the selected recipe and canned pie filling. The canned filling was delicious, only suffering from a paucity of peaches. I knew I could add peaches. The X1 pie looked great. The crust had turned the proper shade of tan, and the filling was attractive under my latticework top. When I sliced into it, I found the first glitch. The bottom crust was still gummy. The aluminum pan reflects heat; thus the top was cooking while the bottom was insulated. Back to the drawing board. I theorized that pre-baking the pie shell would solve the bottom problem and would not impair the quality if I used a precooked filling. I whipped up a batch of the cobbler topping and baked it. It came out crispy on the outside, soft and moist on the inside. It tasted great, but I decided the final product would have some walnuts added for crunch. Now I went shopping and collected all the ingredients I deemed necessary. Not inexpensive, if I must say so. On the Thursday before the contest I peeled and cooked peaches. From several sources I had learned, I thought, that you can dip the peaches in boiling water for a minute or two and then quench them in cold water and the skins will slip right off. WRONG. Some of the peaches will require a body grinder to remove the skins. I found it far easier to use a vegetable peeler on the raw peaches. The peaches were cooked by just putting them in a covered pot with the right amount of sugar, and letting them set over low temperature until they were soft. No water added or needed. Also on Thursday, I mixed up the crust dough and the cobbler topping and put them in the refrigerator for overnight keeping. I then made up a batch of oatmeal crunch topping to go on the pies instead of the traditional latticework crust top. A little something special to catch the judge's eye and taste buds, I thought. Sunup Friday found me in the kitchen ready to make prize-winning desserts. First order of business was to bake the piecrusts. I rolled the dough out using a cold bottle of wine for a rolling pin. I soon knew there was a lot I didn't understand about rolling piecrust, especially the cream cheese recipe, but I finally managed to get two of the pie pans covered with a reasonable looking crust. Into the oven they went. A peek in the oven after about fifteen minutes revealed the first disaster of the day. My prize crust had turned into something resembling a squashed hushpuppy. I must have measured something wrong. Into the garbage can the failures went. Only option was to fall back on the old reliable lard piecrust. It's simple and quick. Soon I had two decent looking crusts for the pies. Some of the peaches will require a body grinder to remove the skins. For the cobblers, I intended to line the pans with pre-baked crust using the lard recipe. I only had enough dough to line the bottoms of the pans and I didn't feel like making a trip to the store for more lard, so just the bottoms got a lining. Time for the filling. I could not find any more of the brand of peach filling I had used in the X1 pie, so I bought a substitute brand. It turned out to be very bland. Only thing to do was to zip it up with some lemon juice, extra sugar and salt. Along with my additional peaches, it tasted pretty good and looked nice. The orange color of the native peaches contrasted nicely with the yellow of the canned product. The cobbler pans were filled. I used a melon baller to make one-inch balls of topping which I tastefully arranged on the top of each cobbler. Into the oven they went. About half an hour later, the filling was bubbling and the topping had taken on an attractive tan. I put them on the cooling rack and turned my attention to the pies. I filled the shells and arranged some of my cooked peaches around the perimeter in an attractive pattern. I cut out two stars from my excess lard dough and placed them in the center. My oatmeal crunch went around the top of the pie, leaving some of the attractive peach pattern revealed. Into the oven with them. When the stars had turned the right color and the crunchy topping was bubbling, the pies were done. I had done all I could do for them. There was no way for me to taste the finished product. You can taste chili or stew or even barbecue, but take a bite out of a pie and someone is going to notice. Needless to say, I didn't make the top four in the contest. After the failure of the select crust, I knew I had lost, but I was too far into the process to back out. I have been in contests where there were only three entries so there was always a chance I could get a red ribbon. No way, Jose. I accept my defeat. I have no one to blame but myself. The moral of this story is, "If you are a couch potato, don't enter the Boston Marathon". I simply was not prepared. Before the next contest rolls around, I will have baked twenty or thirty pies and an equal number of cobblers. Next year I'll know what I'm doing. Here are the winning recipes for the first place winners in the pie and cobbler contest as provided by the Stonewall Texas Chamber of Commerce. Combine ingredients as usual for piecrust, and roll out top and bottom crust. Combine all ingredients and pour into unbaked piecrust. Cover with top crust, crimping edges and making vents for steam. Sprinkle top crust with milk and sugar. Bake one hour at 350°F degrees. Mix flour, salt and Crisco until crumbly. Add egg/water mixture and mix with a fork until it forms a ball. Roll out one half the dough to fit an 8x8x1-3/4-inch pan. Roll the other half of the dough and cut into ten 1/2-inch strips. Fit the solid piece of dough into the pan, and pour in the sweetened peaches. Then, crisscross the strips over the top. Bake one hour and twenty-five minutes at 350°F degrees. Cover the last twenty minutes with aluminum foil to prevent over-browning. When time is up, remove and sprinkle with cinnamon and sugar. Don't forget TexasCooking.com's article on how to make a peach cobbler, as well.